Connect to the GGArmy through facebook. Log in using your Facebook account, so you'll never need to remember another password! If you have previously registered for ggarmy.com using the same email address you use for Facebook, your old account will automatically be linked to your Facebook account from now on. Joining the GGArmy is free. By the filling in the form below you're instantly a member and will receive email updates on all that's happening with the group, the Socceroos and Australian football PLUS you will able to view Australia's only FREE football magazine ITYS. Register without connecting to your Facebook account. Returning to England in the Championship on Saturday, Socceroo Adam Federici will come face to face with Aussie duo Scott McDonald and Rhys Williams when Reading host Middlesbrough (midnight, AEST), while Paddy Kisnorbo's Leeds meet Ryan Williams' Portsmouth (midnight, AEST). Scott McDonald was out injured, as Middlesbrough drew 1-1 with Coventry City. Scott McDonald wasn't fully recovered from his hamstring injury and missed Middlesbrough's 2-0 win at Peterborough. In England's Championship on Sunday, in-form Socceroos striker Scott McDonald limped out of Middlesbrough's 3-1 win over Birmingham City with a hamstring injury. McDonald had to be replaced at half-time in the game after receiving a knock early on but Boro boss Tony Mowbray said his substitution was precautionary. "I don't think it's a bad one, I'm hoping it's only a slight strain,” Mowbray said. Scott McDonald played the full 90 minutes for Middlesbrough but failed to trouble the scorers. Despite not scoring McDonald had a solid game. He made a good run before whipping a low cross in for Marvin Emnes to score Boro's opener. 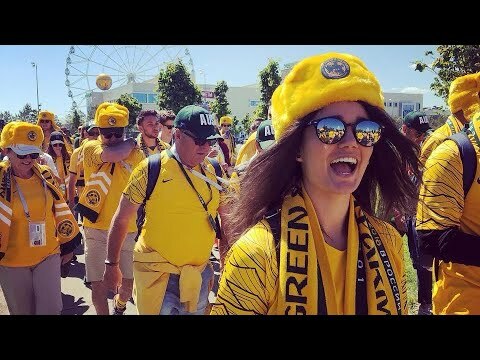 Re-live all the highlights from the Green & Gold Army's 2018 FIFA World Cup tour in Russia. The third and final match for the Socceroos at the FIFA World Cup in Russia. What an incredible atmosphere to be a part of here in Sochi with the Peruvian supporters. Experience the highs and lows of the France vs Australia match through the eyes of the Green and Gold Army. Another spectacular game day here in Russia! Re-live the action of our pre-match party and the match against Denmark, to keep our World Cup hopes alive. The 2018 Green and Gold Army World Cup tour has kicked off. A sea of gold Ushankas, a 5-0 win by the host nation, and plenty of singing, dancing and (a little) vodka.